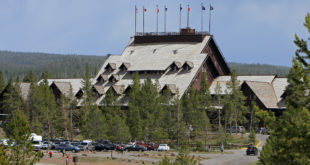 Variable pricing, also known at demand-based pricing, is coming to Yellowstone hotels, as the National Park Service is allowing Xanterra to alter its pricing structure at Old Faithful Inn, Lake Yellowstone Hotel and Canyon Village. When you visit Yellowstone National Park today, the historicity of its hostelry is apparent. After a long day of geyser gazing and backcountry hiking, there’s nothing better than a cold one at a Yellowstone lodge. Here’s our review of the best places for a cold beer and cocktails in Yellowstone National Park. After two years, renovations at the Lake Yellowstone Hotel are finally finished. The two-year Lake Yellowstone Hotel renovations are close to completion, as last year’s improvements are being followed up this spring with more room overhauls and other enhancements.